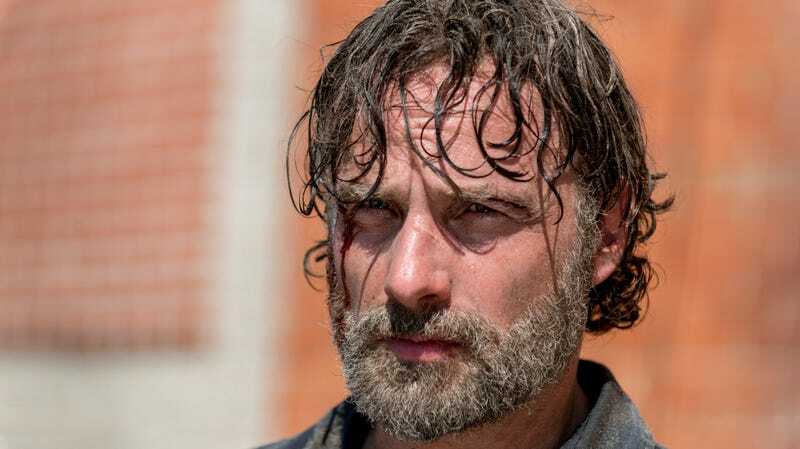 After eight seasons as cable TV’s unchallenged master of grizzled, bearded zombie slaying, Andrew Lincoln might be getting ready to hang up his big shiny gun and mostly-okay American accent at last. Collider is reporting today that the Walking Dead star is apparently planning to bow out of AMC’s long-running undead kill-a-thon sometime next year, and, while it’s still early enough that we’d suggest taking this all with a big, gore-splattered dose of salt, if true, it would mean the often-fractious blockbuster is suddenly losing one of the most stable presences in its frequently tumultuous roster of survivors. Lincoln’s been playing poor, traumatized Sheriff Rick Grimes since the show’s very first episode, enough time to take the character through the Kübler-Ross grieving process about five times over, with plenty of extra steps like “gun-waving shouting,” “super-creepy nihilism,” and “farmer” along the way. Meanwhile, the news comes at a particularly fraught time for the doggedly persistent AMC series; ratings are down, and the network just emerged from touchy contract negotiations with co-star Lauren Cohan, whose other TV commitments mean she’ll only be doing a limited run on the show’s upcoming ninth season. Assuming this all comes to fruition, though, Lincoln’s departure sometime next year will, as always, leave just a little more weight resting on the resolutely likable shoulders of the series’ dark horse hero, Daryl Dixon. That same Collider piece reports that the show’s producers have approached actor Norman Reedus to step up even further if Lincoln leaves, moving Daryl into the ensemble drama’s leading spot. Meanwhile, Collider is keeping tight-lipped about how Rick will ultimately exit the show, although our long-time familiarity with the franchise leads us to think he’ll probably peacefully retire somewhere in order to live out his remaining days in safety and comfort.